Gemini: The Duplicate Finder Released! Hurray! 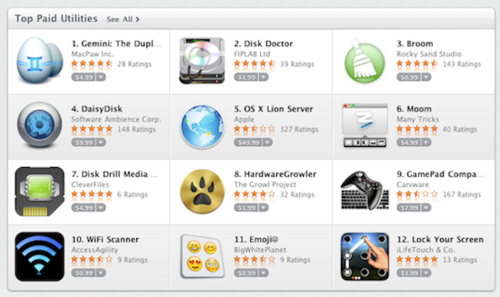 Last Thursday we released Gemini: The Duplicate Finder in Mac App Store. The idea behind Gemini was to create a duplicate finder for Mac that will be really useful and handy for users. However, we had never expect Gemini will get such a huge attention. In just a couple of days Gemini made its way to the FIRST top paid and grossing app in so many countries! The programme is a joy to use with a beautiful interface. Well done to whoever created it. Brilliant. Great user interface, fairly fast to perform the scans on large folders. Really nice! Very easy to use, great functionality! We also added the ability to tweet the results of cleaning and you can easily see them by searching #GeminiApp in Twitter. Of course, we keep improving our app and have already found a few bugs, so stay tuned for new versions to come really soon. And we would love to hear from you how to make Gemini even better. You can always add or vote for an existing feature request here. It is so great when the idea turns into such a magical product that people are eager to write reviews and give feedback on it. Thank you all for that. And if you still don’t have Gemini, is there any reason left not to buy it on the Mac App Store?